The past three days have been a whirlwind of sorts. Friday was an absolute roller coaster of emotions. David and I spent the first few hours of the day providing emotional support for a couple of friends. It’s not my story to tell but I will say I was reminded of how difficult it is for me to remain even slightly detached from the pain of others. This trait made me a compassionate hospice nurse but really takes its toll on me at times. I hold it together when I need to and then fall apart in private. Even though the outcome of Friday’s situation was positive, I had to hear things I’d rather not have. Before I knew what Friday had in store for us, I had purchased some really nice filets at the local meat market and planned an at-home date night for us. Despite the change in plans, I still fixed us a nice dinner of steaks, baked potatoes, wedge salads (topped with crumbled bacon, diced red onion and bleu cheese crumbles), and roasted asparagus. Chris and some of his friends wanted to play Cards Against Humanity with us. I am ever so grateful that our kids and their friends enjoy being with us and actually choose to hang out with the “old folks” on a Friday night. Justin (our son-in-law) was busy working on a university course he is taking but Lisa was able to join us. As soon as I knew our plans had changed I whipped up a batch of “The Best Brownies – Ever!”. The house was in decent shape already (thankfully, because I didn’t have the emotional energy to do much cleaning) and besides, I knew this group wouldn’t care. We ended up with Lisa, Chris, Kadi, Kadi’s sister, and two other friends. We had an absolutely hilarious time playing the game and eating brownies. It turned out to be just what I needed to lift my mood. Besides, Shiloh LOVES company. On Saturday, David had to work a few hours and I just piddled around at home. He got home just in time to observe Earth Hour with me. I cooked up several veggies (zucchini, yellow squash, carrots, asparagus, potato, red bell pepper, onion) in some butter, chicken broth, and white wine which I served over brown rice and topped with grated cheese. We ate that and a salad by candlelight. We took our time, enjoying each other’s company. My phone and Bose docking station were fully charged so we were able to listen to music while we ate. Even though Earth Hour was officially over by the time we finished eating we left the lights (and computer) off. I put away the food and cleared away most of the mess in the kitchen by candlelight and then left the rest – something I almost never do! We then took our bottle of wine and candles to the family room. David had built a nice fire in the fireplace just before dinner and we spent the next couple of hours playing Scrabble and sipping wine. It was such a nice way to spend an evening that I’m hoping to do it more often. 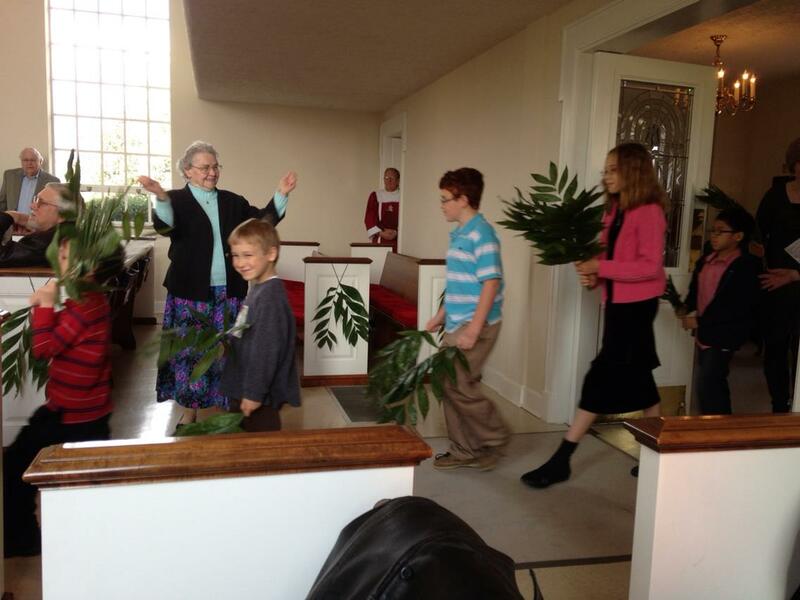 Yesterday was Palm Sunday. We had a lovely service. I always enjoy watching the kids process in waving their palm branches. 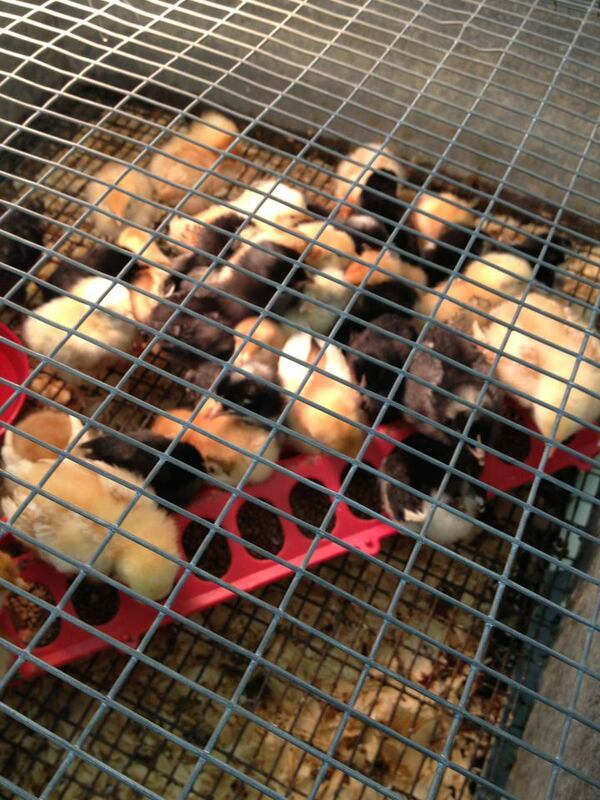 Baby chicks are here! Well, not here. But hopefully next week it will be warm enough to kick the cats outside because we need the laundry room for the baby chicks. I’m so excited about having chickens again. I’ve really missed them…and the eggs. And finally, I have to tell you what Shiloh did Saturday. We have a very large balcony across the front of our house and our bedroom opens onto it. Shiloh was being sort of pest-y so David let him onto the balcony. 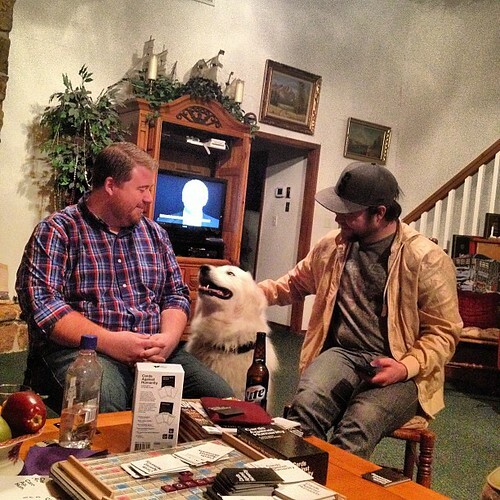 We’ve had this discussion about how I don’t trust him out there so David was keeping an eye on him. That is how he happened to see Shiloh stick his leg through an opening in the railing (to look at it, you wouldn’t think that big dog would even fit through it) but before he could stop him, Shiloh went through it and fell to the ground! We both raced downstairs, hearts in our throats. David got to the door first and there was Shiloh. Dirt on his face but otherwise fine. He must have tumbled and rolled when he hit. Fortunately he landed in the spot where he had dug himself a place to lie in the dirt rather than the concrete walkway. So glad that Shiloh is okay…I wondered where he'd jumped from…Is hardware cloth or something like that in the future for the balcony rail? I'm sorry that Friday was such an emotional day but happy that you were able to be there for your friends. And Saturday evening certainly sounds lovely. Unless we ever enclose the balcony (we've talked about it but it's not in the current budget) Shiloh won't be allowed out there. Scared me to death! We ended up being able to observe Earth Hour and spent the time taking a very long walk around our farm. The moon was almost full and the sky was clear so we had great visibility. 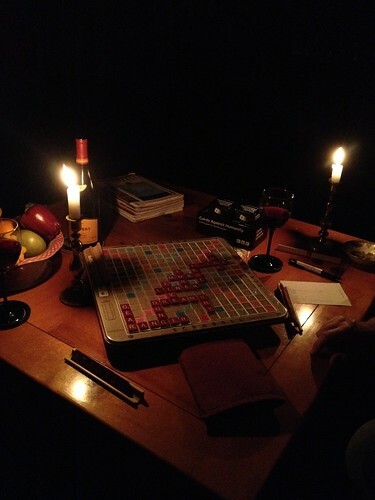 My alternate plan, if the weather hadn't permitted a walk, was to play Scrabble by candle light. Glad Shiloh was fine. I think I would have been hysterical if my dog had done that! Sounds like a lovely night. And yes, I was totally freaked out by Shiloh's stunt.